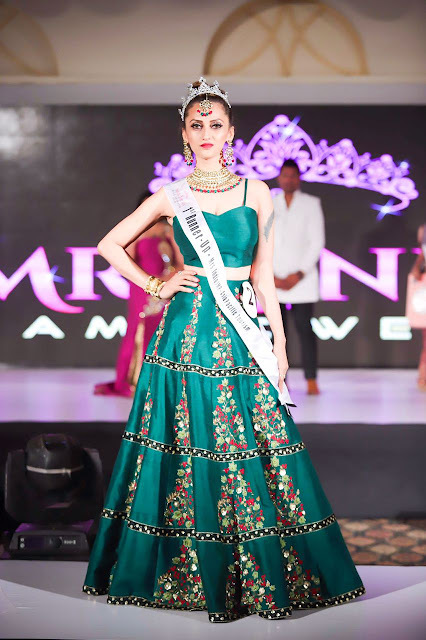 Mumbai, June 6, 2018 : For Shilpi Bose winning Mrs India Asia Pacific 2018 Title was a cherry on top. She also won the Mrs India Fashion Icon Title 2018. The National pageant was held in mid May at Cidade - de - Goa with the other State winners from all over the country. It is a feather added to her crown, a pit stop in her journey that began as a writer to Digital Marketing to an uprising Fashion Luxury Blogger and model in the Fashion industry. She has also been conferred as a FEMALE GEEK by the US Huffington Post in 2011. A beauty with brains as they say, Shilpi is a well traveled woman with a creative streak. “It’s my dedication, passion and hard work towards my goals which has brought me where I am today. And with the support of my family, I can pursue my dreams and make them come true.” She aspires to empower women, be a role model and work for uplifting the underprivileged by creating awareness and imparting knowledge. A casual participation in the Mrs India Maharashtra State Pageant led her to the auditions, selections and winning the State Pageant as the 1st Runners Up. The proverbial ‘beauty with brains’ applies to me, says an unpretentious Shilpi Bose whose response to the question, ‘What are the greatest assets of a woman?’, won her the crown. Her reply, ‘The greatest assets of a woman is her integrity, compassion and grace. She is strong and powerful at the same time with the ability to achieve the impossible. These make her unique, special and not the materialistic things’, warmed audience’ and judges’ hearts. The confident Fashion Blogger is enjoying the success which has provided her more visibility and open doors to carry forward her ventures.